Please find a list of research & scientific studies listed below, that look at the positive effects of using hypnosis and other techniques (used in the Hypnobirthing Australia course) on birth outcomes. 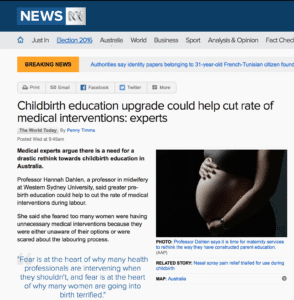 In this very recent (released July 2016) ground-breaking Australian study by Dr Kate Levett; independent childbirth education which included relaxation, breathing, meditation, massage and acupressure was shown to greatly decrease interventions in childbirth. 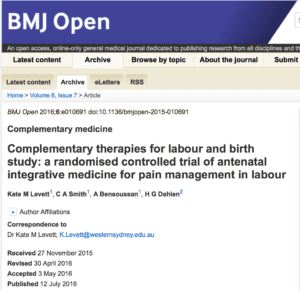 “Unexpected consequences: women’s experiences of a self-hypnosis intervention to help with pain relief during labour”,Finlayson , Downe, Hinder, Carr, Spiby, Whorwell. BMC Pregnancy Childbirth. 25 Sep 2015. BACKGROUND: Self-hypnosis is becoming increasingly popular as a means of labour pain management. Previous studies have produced mixed results. There are very few data on women’s views and experiences of using hypnosis in this context. As part of a randomized controlled trial of self-hypnosis for intra-partum pain relief (the SHIP Trial) we conducted qualitative interviews with women randomized to the intervention arm to explore their views and experiences of using self-hypnosis during labour and birth.